Debbie Cerone is a Chicago-area based mural artist who specializes in residential and commercial murals and loves to transform children's rooms and nurseries. She has been a 'featured artist' in the Chicago Tribune, Daily Herald and Northwest News and was honored to have been asked to paint murals in the Cavalcade of Homes, Chicago Luxury Home Tour and Parade of Homes. On this website, you'll find complete information on Debbie's services, which include Residential and Commercial Murals, Murals for Showcase Homes and Children's Rooms or Nurseries, Hand-Painted Accents, and Everything Wine! "I LOVE your prints! I want to put them all over my house! :)"
"Absolutely beautiful prints! I love the personalization on each one. Your art is amazing!" "Absolutely LOVE this set and personalization makes it extra special. Great nursery decor!" You'll be suprised at just how affordable a DEBBIE CERONE MURAL can be! Call her at 630-841-1960 today for a free "guesstimate!" Debbie takes pride in each job - no matter how small! Her client's love working with her as is expressed in the many testimonials. Because of this, a large part of her business comes from repeat and 'referral' customers. Whether it's a Trompe L'oeil window painted on a (once bare) wall, a custom quote or a full wall mural – Debbie's work can take you to another place and time. Imagine waking up every morning to a beautiful North Woods lake or Tuscan sunset. Hand-painted wall murals can transform a whole room into a work of art! We hope you enjoy reviewing samples of Debbie's work. For quick and easy navigation, gallery category links can be found at the top of the right column on every page. In addition to Chicago area children's and residential murals, Debbie is now designing and shipping her children's watercolor art prints worldwide. Please visit Debbie's Etsy shop, selling fine art prints for children in 6 sizes. Personalized for free. Featuring Paris, London, hot air balloons and much more! 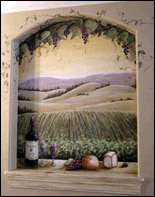 See Debbie's murals and other artwork for wine lovers and aficionados under Everything Wine!